Country musician Porter Wagoner, who helped launch the career of Dolly Parton, has died in Nashville aged 80 after suffering lung cancer. The singer, famed for his rhinestone suits, had his own US TV show which ran for 21 years until 1981. 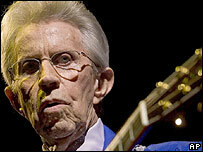 In 2002 he was inducted into the the Country Hall of Fame and marked his 50th year at the Grand Ole Opry in May. Pete Fisher, general manager of the famous Nashville concert hall, said: "His passion for the Opry and all of country music was truly immeasurable." Country singer and fellow Opry member Dierks Bentley, who visited Wagoner at the weekend, said: "The loss of Porter is a great loss for the Grand Ole Opry and for country music, and personally it is a great loss of a friend I was really just getting to know." Wagoner signed his first record deal in 1955, and had hits including Carroll County Accident and Green Green Grass of Home. His TV show, which became one of the first syndicated programmes from Nashville, gained him a reputation for showmanship and his trademark bouffant hairstyle. He invited Dolly Parton to perform with him on the programme, and their partnership earned them the Country Music Association's title of duo of the year in 1970-1. After the partnership dissolved and Parton found solo fame, Wagoner sued her for $3m (£1.45m). The dispute was settled out of court in 1980. In 1982 Wagoner said that his show had been a "training ground" for Parton, in which she "learned a great deal and I exposed her to very important people and the country music fans". Speaking in 1995, Parton said they split due to creative differences, saying: "I was creative and Porter was different." Earlier this year, Wagoner called Parton "one of my best friends today", while she visited him in hospital. After years without a recording deal in the latter part of his career, Wagoner signed to Los Angeles label Anti Records, the home of acts including Nick Cave and Tom Waits. Earlier this year, he was a support act for The White Stripes at New York's Madison Square Gardens.